What a cute idea! I made this unicorn into a card that could be used for just about any occasion. White with a pink mane. The unicorns are cut from white and black mat card stock. Two of the larger parts of the unicorn body are cut from sparkly dark pink card stock and the horn and wings from a light pink card stock. The cards are dimensional and are joined together at the head with a brad. The inside of each of the cards is white and has been left blank. The card measures 5 1/2" x 4 3/4". 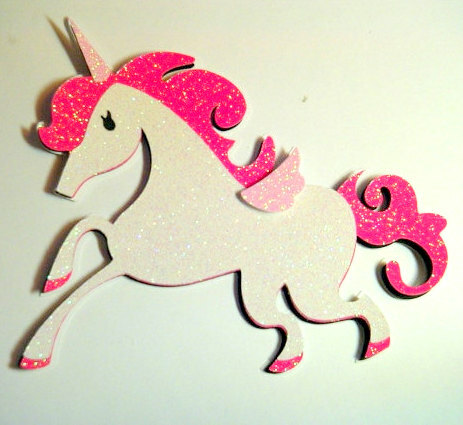 The white unicorn card comes with a white envelope that has been lined with pink paper.